SAN GABRIEL, CA – Gabrielino High School graduate Alexandra “Lex” Singleton’s high-energy approach, lively gestures and outlandish voices have earned her dozens of state and national accolades during her four years with Gabrielino’s speech and debate team. Now, Singleton has her sights set on one final victory: the 2017 National Speech and Debate Tournament, where she will perform excerpts from “Bunny, Bunny: Gilda Radner, A Sort of Romantic Comedy” as the late comedian Gilda Radner. Singleton, along with 19 other Gabrielino High speech and debate members, will clash with the country’s best high school speakers at the national tournament from June 18 to 23 in Birmingham, Alabama. Since joining the program as a freshman, Singleton has ranked 10th among competitive high school speakers in California, qualified for state and national tournaments four times and earned 2,496 tournament points – the most in Gabrielino history. 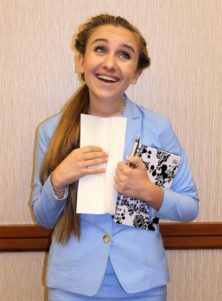 Singleton said the performance aspect of speech and debate has inspired her to become a theater major when she attends UC Santa Barbara in the fall, while the writing and planning aspects of the program have given her an interest in screenwriting and directing. While the years of practice-filled nights and tense competitions have given Singleton lasting memories, she plans to conclude her speech legacy at Gabrielino and put her skills to use in theater. 061217_SANGAB_LEX: Alexandra “Lex” Singleton will bring her trademark energy to the 2017 National Speech and Debate Tournament from June 18 to 23 in Birmingham, Alabama, where she will perform excerpts from “Bunny, Bunny: Gilda Radner, A Sort of Romantic Comedy” as comedian Gilda Radner. Alexandra “Lex” Singleton will bring her trademark energy to the 2017 National Speech and Debate Tournament from June 18 to 23 in Birmingham, Alabama, where she will perform excerpts from “Bunny, Bunny: Gilda Radner, A Sort of Romantic Comedy” as comedian Gilda Radner.